Check out our exclusive collection of stainless steel cutlery sets, which feature reliability, quality, durability and aesthetic look. With sophisticated infrastructure we can produce these cutlery sets in bulk quantities within stipulated time frame. 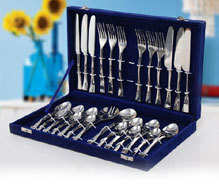 We offer these metal cutlery sets in elegantly designed boxes for their safe delivery. The flairy cutlery set (hand made cutlery set in gift box) comprises of serving spoon, dinner spoon, fork and butter knife. Made of quality steel, every piece of the set is intricately modeled to accentuate the modern dinning table. 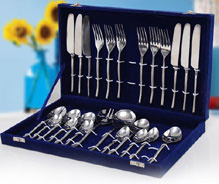 The cutlery set is offered in a sumptuous black wood veneer storage case. This exquisitely crafted handmade cutlery set is the perfect way to accent your table for the special occasion. Made from quality 18/10 stainless steel, the set comprises of table knives, table forks, dessert knifes, dessert forks, soup spoons, tea spoons & dessert spoons. Available in exquisitely crafted box, this set makes a perfect wedding gift. 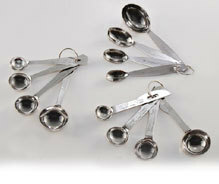 Our measuring spoon set is ideal for both dry and liquid ingredients. Easy-to-read standard and metric size markings on the handles ensure fool-proof measuring. The measuring spoon set nests neatly for easy storage, and the large ring keeps the spoons together allowing for easy removal.